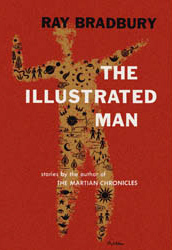 The Illustrated Man: Chapter Five -The Man - Jimmie Aaron Kepler, Ed.D. A group of space explorers land on a planet to find the population living in a healthy state of bliss. Upon investigation, they discover that an enigmatic visitor came to them. Further description leads the two spacemen to believe that this man is Jesus (though he is never named, leaving room for other religious personas). One decides to spend the rest of his days on the rejoicing in the wake of the man’s glory. The other continues in his spaceship, chasing ‘him’ always a step behind, never fast enough to catch up to him, constantly trying to achieve the unachievable. Other members of the crew decide to stay on the planet to learn from the contented citizens, and are rewarded by the discovery that he is still on the planet.